Every once in a while our team has the opportunity to tell a story that we can't wait to share with the world. As part of an initiative to thank the donors that make bursaries and scholarships possible, the UVic team wanted to showcase Atem Machar's incredible journey to an education on the west coast of Canada. With invaluable creative input from the University's communications team, we decided to tell this story in a unique format - through the words of Atem's own letter to those who made his education possible. 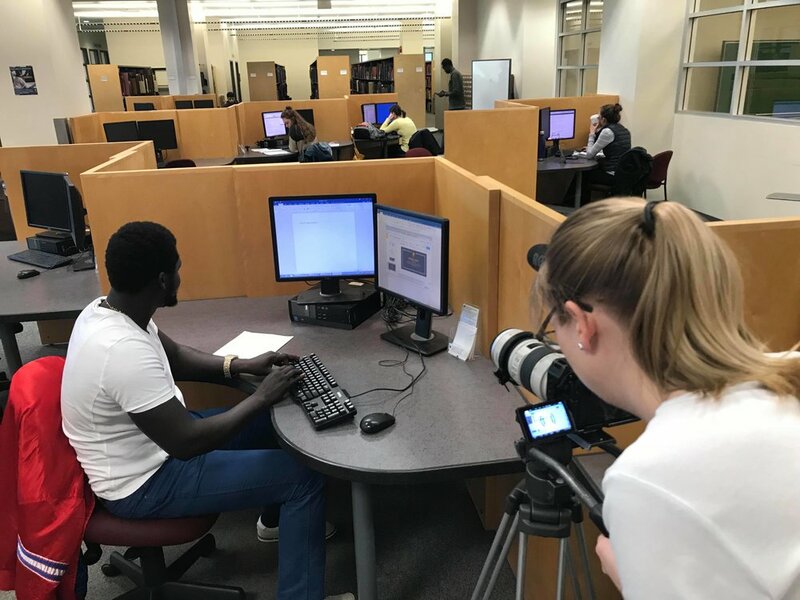 By mixing scenes of Atem writing his thank you note with elements from his time on campus and some archival footage from creative commons sources online, we were able to carefully weave his complex story together. Needless to say, it was incredible to work with someone who has overcome incredible hardship with determination and sheer will. Listening to Atem, along with both Denis and Pat, gave us new appreciation for those who find the strength persevere in the name of education. This is a project we won't soon forget, and are proud to share far and wide! After the successful launch of our first Vikes Legacy Fund video, the rowing program asked us to come back and create a piece to specifically celebrate the incredible heritage of the women's program. Over the course of the past 30 years, more than 50 Vikes ladies have donned the Canadian colours in international competition, and as the program looks to reclaim its status atop the university ladder, fundraising for new equipment and resources is key. That's where our video comes in, as a tool to motivate and inspire Vikes alumni and partners to back this prestigious program. Right from the start it was clear that we had to find a way to connect the champions of the past with the current crop of Vikes athletes. After sifting through the archival images provided by long-time UVic coach Rick Crawley, the answer was clear to our creative team - animate the vintage images and transition to recreated scenes with the rowing crew of today. Through a combination of Photoshop, After Effects and PhotoMotion software, our team began the demanding task of bringing the old black-and-white images to life, adding subtle movement and lens effects to the scene. With our archival images chosen, we then hit the water with the Vikes ladies to carefully replicate each of the photos - right down to the fateful coxswain toss into the lake! It took plenty of fine tuning to make sure the angles, light and positions of the rowers were just right - but we couldn't be happier with the end result. If you're keen to learn more about the program, or lend your support to some of the finest athletes Vancouver Island has to offer - swing over the the Vikes Legacy Fund site. Sometimes, recycling can get confusing. Is it soft plastic or hard plastic? Is there wax on that paper? Compost or land waste? The list goes on. Well the University of Victoria has an extensive recycling program, and wanted to combat this confusion with some videos that laid out students' options for some of the most confusing recyclable objects in a fun way. And who better to keep order with recycling than campus mascot Thunder? We took the intrepid face of the Vikes across campus to dish out a bit of tough love to students who weren't exactly recycling the way they should. One of the most difficult things to convey in video is humour - and while 'laugh out loud' isn't always the goal, a bit of a chuckle from the viewer goes a long way toward making a memorable clip. Our challenge was to get the important message across through body language only, and kudos to our student actors for having a little fun with the role. With some carefully placed sound effects to accentuate the key moments, we believe this series gives students a lighthearted look at an important topic, that will hopefully give them reason to stop and think next time they visit the bins. There's no better way to showcase diversity within a community than by hearing from a wide range of voices. And that's what we did when brought on by University of Victoria's Office of the Vice President Academic and Provost to create a video for their 10th Diversity Research Forum. "Diversity" means many different things to people, and we wanted to get an understanding of those ideas through our interviews. With so many people involved in the video, flexibility with a variety of schedules was key. It was also important to find a way to show what "diversity" looks like in picture, so getting creative with visuals and activities became essential. What could we use to showcase the efforts which UVIC has taken over the past ten years to increase inclusion? Demonstrating interaction among peers from all walks of life was important in this, as well as scenes of communication. Feedback to the project was very positive, and we thank the team at UVIC for the opportunity to showcase their efforts as well as congratulate them on this milestone. Shoots are always made interesting with death metal happening in the studio down the hall! Since 1965, the University of Victoria has been home to the most successful collegiate rowing program in Canada. In fact, there hasn’t been an Olympics since 1965 without a UVIC Vike in one of the rowing crews. We were first contacted by a Vikes supporter, John Heron, who was interested in showcasing the program to assist in their bid to raise funds for new equipment. While the women's team is in need of a new eight boat, the men's team needs a new catamaran, a men's two boat, and a straight four boat as soon as possible. It became apparent that former Vikes rowers who could support this program would be integral to the fundraising effort and the best way to reach them would be through a powerful video feature. We've always admired how dedicated the rowers are for being out on the water at the crack of dawn every morning, which conveniently is also the best time for videographers looking for that 'golden hour' shot. Everything looks beautiful when the time is right! The one challenge of the shoot was that it had to take place principally on the lake, with our equipment precariously perched on a coach boat (with no sides) - although having our gear uncomfortably close to the water is something we have gotten used to! To reach a larger audience for the final product, the Vikes asked for our Digital Marketing Plan add-on, which saw their posts targeted and boosted across all social media platforms. To learn more about how you can assist the UVic Vikes Legacy fund, click here. The more elaborate a shoot is, the more preparation is a key factor - and that was exactly the case with our latest University of Victoria shoot featuring the school’s Campus Planning and Sustainability Department initiatives. Our involvement in the planning stage of the process varies from video to video. With UVIC, they already had a clear idea what initiatives they wanted to feature, so we worked together to formulate a script that covered each of those areas, ranging from the campus community garden to their recycling initiatives to their green buildings. We worked especially close with John Ho of the Campus Planning and Sustainability Department, who would handle the scheduling, provide us with our actress and assist on the day of the shoots. Weather this autumn was not our friend, and after a literal rain check or two we managed to find a couple days to get the job done. Organization was key with so many scenes to include and it was certainly a team effort to check each location off the list and get the lines right. And no matter how scripted a shoot can be, there will always be changes to the plan, so adaptability is key. A special thanks to John and the Campus Planning and Sustainability Department , as well as our actress Quinna and all student extras who helped make the process enjoyable and the shoot easy to navigate.